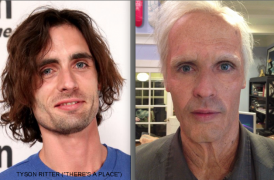 PR NEWS WIRE: All-American Rejects' Tyson Ritter Ages at the Hands of Makeup Effects Artist Tony Gardner - ALTERIAN INC. When Director Catherine Hardwicke was dreaming up the concept for her music video for the song “There’s A Place,” a very moving song from her Drew Barrymore/Toni Collette film “Miss You Already,” one of the biggest challenges was how best to illustrate the passing of time and love lost. The song was written and performed by Tyson Ritter, the front man of the band All-American Rejects, and was written specifically for the film; Tyson is in the film as a love interest of Toni Collette’s character. As Tyson would be singing the song on camera within the music video, it was decided that he would in essence represent his film persona within the video, and gradually age from his thirties into his nineties during the course of the performance. A great way to illustrate the passing of time, but how to achieve all of this within one night of guerilla style film-making? Tony Gardner is no stranger to projects with high demands. Director Danny Boyle came to Gardner to realize sequences from the film “127 HOURS,” asking Gardner to design and create the prosthetic effects pieces that would allow James Franco to cut through and sever his arm on camera and in real time, and with complete medical accuracy. He’s also had his share of odd requests, from creating robotic helmets for Daft Punk, to creating movie characters with a high list of demands. Time was definitely the major challenge, as was the complexity of the final stage of prosthetic makeup. To solve the issue of the three hour application time for the 90-year-old version of Tyson, it was decided that Tony and Hugo would start that makeup while the sun was still up, and time the completion of the makeup to sunset, so filming could start literally the moment the sun went down.